If the intention of the government of Sierra Leone today was to show the World Bank president, how effective its coordinating strategy has been in combating the Ebola virus, then Ebola must have had a different and shocking agenda. 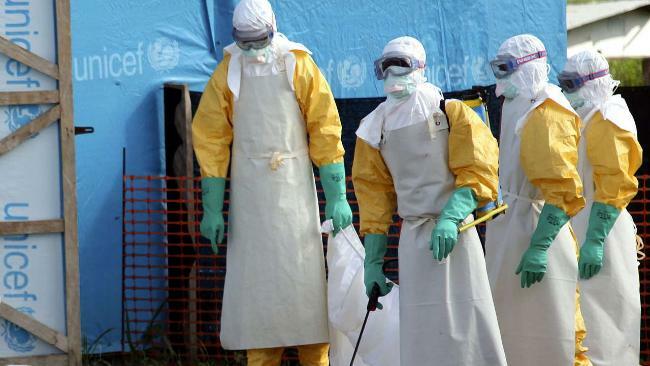 As the World Bank chief arrived in Freetown today, the number of cumulative Ebola cases in the capital was fast making its way to an all time high of 2,223 – an increase of 396 new cases in the last thirteen days. Figures for the country as a whole was even less flattering for the man who controls the World’s finances, as the total number of cumulative confirmed new cases rose to 6,132 – a massive 93 new cases recorded across Sierra Leone in one day, bringing the total number of new cases in the country to 691 in just nine days. But if these obscene figures were intended to shock the World Bank chief into seeing firsthand, the impact of the Ebola crisis on the country’s economy, then there is little doubt this was achieved. Since the end of the war in 2001, the people of Sierra Leone have continuously and invariably experienced difficult economic upheavals. From economic stagnation to economic recession, high inflation to high unemployment, you name it – they have seen it all. But the ravages of Ebola is now all too much for a nation whose economy only runs on one track – mining. Sierra Leone’s projected GDP growth figure for 2014/2015 has been reduced from an expected 8% to 3%, with government revenue cut by as much as 60% because of the Ebola crisis and its impact on the mining and agriculture industries. Since the arrival of Ebola in Sierra Leone, the World Bank, the IMF and the African Development Bank, have collectively managed to put together an economic rescue package which has been keeping the government of Sierra Leone afloat and the country’s public services functioning. Whilst few expected the Ebola crisis to have lasted this long, critics say that the government’s relaxed initial approach and denial of the existence of the virus, was largely responsible for the uncontrollable rate of infection and transmission, seen in the first six months. 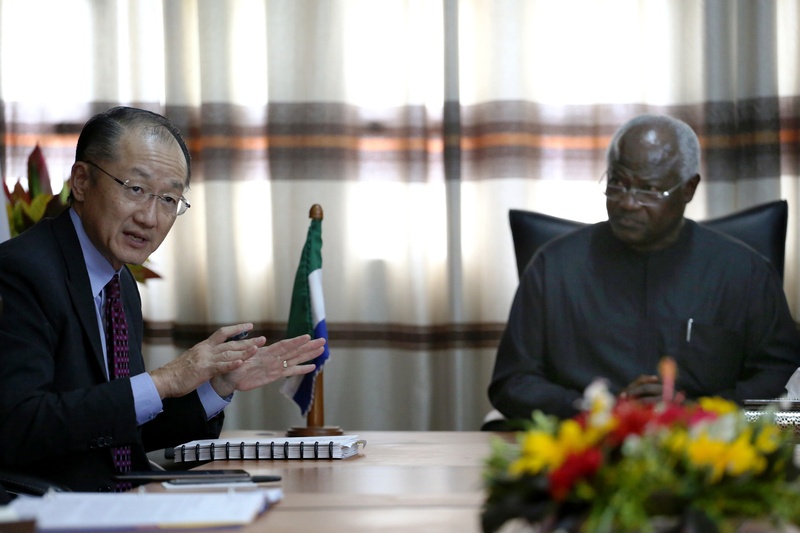 Speaking to the country’s media in Freetown today, Jim Yong Kim had little choice but to boost the morale and confidence of president Koroma and his government, after such criticisms. “First, I’m here mostly to observe and to congratulate the government of Sierra Leone and President Koroma for his leadership and Sierra Leone’s leadership in their response to Ebola,” said the World Bank chief, oblivious of the massive rise in Ebola cases that was unfolding in the capital Freetown today. “President Koroma told me today that he has been walking the neighbourhoods and going directly to the field to change the way people think about it and behave in the face of this epidemic. “Today in our meeting we talked about the importance of finishing the job on Ebola, on getting to zero cases and, at the same time, not waiting to finish, that you need to work on economic recovery. With the country’s economy now spiraling into stagnation, and the country’s main exporter of iron ore – African Minerals, bankrupt, the government is looking for every financial help it can get to keep essential public services running. The government is fast running out of cash and needs emergency support. “Our support will cover five areas,” says Jim Yong Kim. “First, we’ve already provided $160 million to Sierra Leone for the Ebola crisis, and we will continue to support the objective of getting to zero cases as soon as possible. This is going to require many more resources, but we are absolutely committed to finding sufficient resources to get to zero. “This is going to involve intensifying efforts in the west and the north of the country, particularly in Freetown and Port Loko, and empowering district level teams and sub-national emergency operations centres in order to break the chains of transmission and identify all contacts of those infected. “As I said, we cannot wait to get to zero to work on economic recovery. So our second area of support will be agriculture. “We’re concerned that agricultural production has dropped significantly as a result of this Ebola epidemic. We’ll help farmers recover from this crisis by building feeder roads that connect small farmers to markets. “We must make sure that the Ebola epidemic is not followed by a food security crisis. We’re also working on enhancing safety nets to protect the most vulnerable from the economic consequences of the epidemic. “Third, we’ll help to improve basic infrastructure such as urban services and access to electricity that will help the well-being of citizens. “We need to help Sierra Leoneans create jobs to help people recover from income losses as a result of the epidemic. “Fourth, in response to the shortage of finance for businesses, we’ll continue to work through our private sector arm, the IFC, to provide liquidity to local banks. This will support especially small- and medium-size enterprises and local entrepreneurs and farmers. “Finally, the foundation of the Ebola response and the economic recovery is strong governance. So, we’re helping the government to strengthen public financial management. “We’re working closely with the International Monetary Fund and the African Development Bank and preparing several tranches of direct budget support. Three Sierra Leonean doctors dead in 24 hours?